LOS ANGELES, CA – (Thursday, January 5, 2017) — The Devil Wears Prada will hit the road early in the New Year with a slot on what will be one of the heaviest tours of 2017 – a 27-date North American tour as special support to co-headliners Anthrax and Killswitch Engage. The trek, presented by SiriusXM, kicks off at the Wellmont Theatre in Montclair, NJ on March 29 and will zig-zag the continent, culminating in Boston on May 7. Tickets are on sale now; log onto http://www.tdwpband.com/tour for purchasing info. 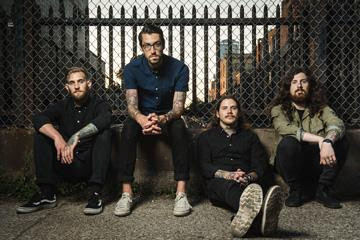 This tour won’t be the first time that TDWP – Mike Hranica (vocals), Jeremy DePoyster (rhythm guitar, vocals), Andy Trick (bass), and Kyle Sipress (lead guitar) – have crossed paths with either band. Prada toured the U.S. with KsE in 2010, and played with Anthrax on the 2012 Mayhem tour. Additionally, Adam D., KsE’s lead guitarist, produced two of Prada’s albums – Dead Throne (2011) and 8:18 (2013).